Here's a story about Tony Dungy and his sons suicide that appeared on this blog when I first started it. It's worth reading again. 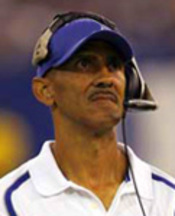 ESPN.com did an amazing story about Tony Dungy, coach of the Indianapolis Colts. The story revolves around Dungy's faith in Christ and how it has sustained him through the most difficult period of his life. The death, ruled as a suicide, of his 18 year old son, James, in December of 2005. Suicide is so difficult to deal with. Often those who are left behind blame themselves or wonder what they have done wrong. Suicide strikes in families of all types. As humans none of us are beyond the despair that can cause us to wish we were no longer alive. Listen to what the apostle Paul said, 2 Corinthians 1:8 "We do not want you to be uninformed, brothers, about the hardships we suffered in the province of Asia. We were under great pressure, far beyond our ability to endure, so that we despaired even of life." What? The apostle Paul despairing of life? Most of us don't think of Paul that way, but none of us are exempt from despair and hopelessness. After a great victory against the prophets of Baal on Mount Carmel, Elijah demonstrates symptoms of depression (see 1 Kings 18.) Nobody is exempt from depression and despair. The article is a great encouragement of how one father in the public eye and spotlight is coping. ESPN named the article "Amazing Grace." Read it here. A link farm of sucide realted organizations and articles can be found here.